The original patent was filed all the way back in 1984, before cell phones were ubiquitous. Before the word "selfie" was even coined, let alone in the dictionary. The first selfie stick was neither as elegant nor as successful as the latest models. Not so elegant. Since there weren't any cell phones with cameras, let alone smartphones with front-facing digital ones, Ueda's original product included a mirror so the user could see what they looked like as they took the photo. Ueda, who worked for camera company Minolta when he invented the extender, held the patent until it ran out in 2003 according to the BBC. "My idea came too early, but that's just one of those things." Ueda told the BBC on Sunday. "I patented about 300 ideas, so that was just one of them. We call it a 3am invention - it arrived too early." 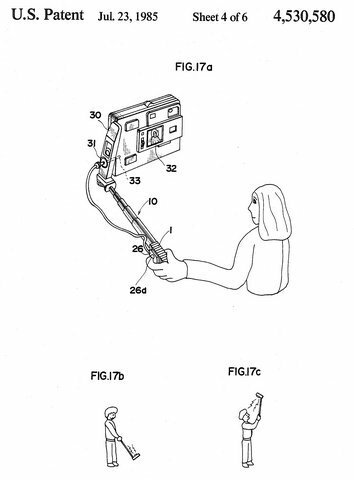 In 2005 another inventor, Wayne Fromm, brought the selfie stick back with his patent for an "apparatus for supporting a camera and method for using the apparatus." He called his product Quik Pod. Fromm feels similarly to Ueda, in that he believes his product came at the wrong time, before smartphones were everywhere. “The selfie stick today would not exist if it was not for me,” Fromm told ReadWrite. Fromm is currently suing many different selfie stick creators for copyright infringement.